Nu Octantis (HR 8254 GJ9744 HIP 107089 HD205478) is an orange subgiant with a close red companion; more. Hipparcos gives its (combined) magnitude as 3.73: at a distance of 69.1 LY this means a total visual luminosity of 12.60436278. The spectral types are given as KO III & K7-M1, while their masses are 1.4 & 0.5 solar. From the latter mass, i would put B closer to M1 than K7. If i set its visual luminosity at 0.01, then A's is 12.59436278; with bolometric corrections of -0.36 & -1.35 respectively, & temperatures of 4750 & 3350 Kelvin, that makes the total luminosities of A & B 17.41446004 & 0.034673685. Derived stellar radii 6.221910712 & 0.558169848. Thus A is a tiny bit over ten times the size of B. The stars revolve in an orbit of 1020 days (2.792559156 y.--which i am using in preference to 2.9 years) & eccentricity 0.2358. This puts their periastron at 1.876980762 & apastron 3.035295507 AU. Not much room for a planet in there! Yet there seems to be: 2.5 times the mass of Jupiter, with a 2:5 resonant orbit of period 418 days--RETROGRADE. (Its eccentricity of 0.123 would bring it to within 1/2 AU of the secondary, as a matter of fact.) Semimajor axis 1.223944353 on the average from A. What i want to know, of course, is the temperature range of the planet (& any hypothetical Earth-sized satellites it may have. The primary star gives it a blackbody temperature of 519.38±32.06 K. The secondary gives it 113.86±56.39 K. Adding these (which i know to be not quite right) gives 633.24±88.45. If the Albedo is set around 0.5 then the planet (call it Volnius--after the only Etruscan poet whose name is known to us) ranges from 185º to 334ºC (not counting the greenhouse effect). A lower albedo, & higher satellite temperature, seems likely. This temperature range would suit a sulfuric (Io-like) satellite with a suitable "pseudo-hydrosphere" of anhydrous sulfuric acid. Let this moon be called Plornish. 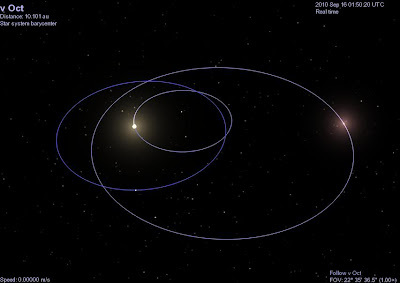 Given the mass ratio of the primary star to the subjovian is 178.0, a satellite orbit seems to be stable out to 0.035 AU (= period 26.95 days), while the "Callisto limit" (the closest it can be without receiving too much radiation from the subjovian) may be around 0.031 AU (22.5 days). I note that this orbit probably comes to an integral ratio to the period of its planet; 17 seems right. Its distance would then be 0.032921918, or 3.06 million miles. That corresponds to a satellite orbital period of 24.6 days. That would be the solar "day". Adding (instead of subtracting, for retrograde) the synodic periods gives some 296.5 days, & the ratio of the two (a significant number for any calendar) of pretty close to an even 12. The apparent size of star A is 5.07, star B varies from 0.13 to 1.1, & the disk of Volnius, if it is the same size as Jupiter, would be around 3. While Volnius would presumably not move in the sky whatever the observer's position on Plornish, both suns would probably disappear behind it at intervals. 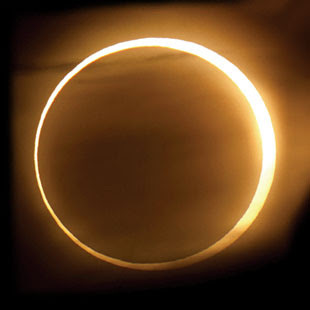 The eclipse of star A, however, would be only an annular eclipse.